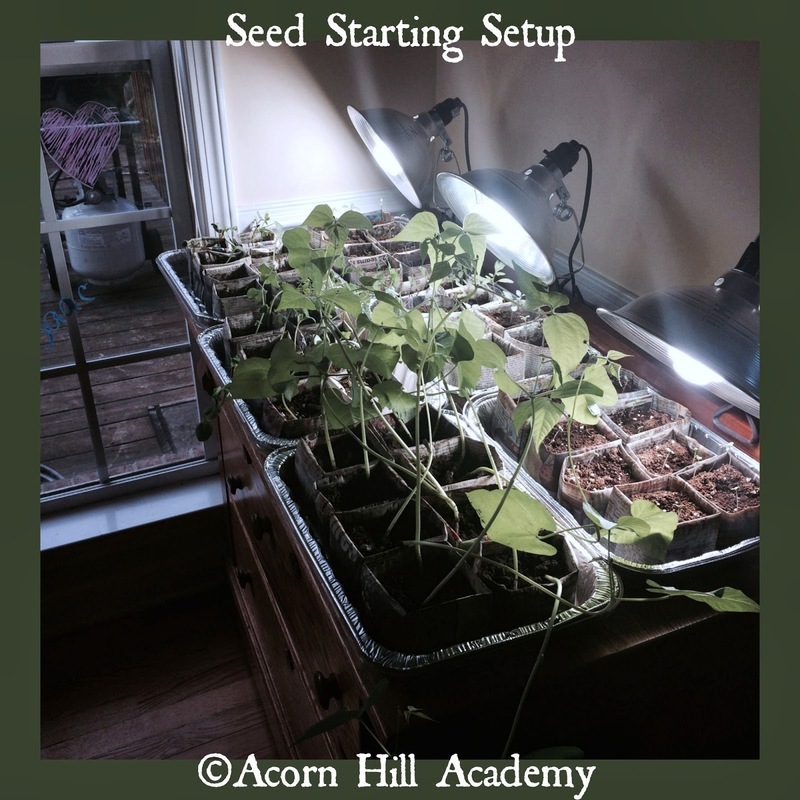 Acorn Hill Academy: Garden Progress! I few weeks ago, I mentioned we were starting our very first garden by making some origami pots from newspaper, in order to plant some seeds. I have a very low-tech seed starting setup. I put the pots in disposable 9"x13" cake pans, which came with plastic lids that served to make mini-greenhouses. I used coconut fiber seed starting medium in the pots and planted the seeds. I hadn't planned on using lights, but my sister told me her seeds sprouted much more quickly with one, so I decided to try it. I went to a local home improvement store, and asked for grow lights. They showed me some large shop light fixtures and fluorescent tubes, but I had no place to hang the fixtures. I ended up getting clamp-on shop lights with the strongest daylight bulbs I could find. My wonderful husband found a light timer for me, so I don't have to remember to turn them on and off. Guess what? I have PLANTS GROWING! I know this is the expected result, but I have not done well with seedlings in the past. I have either drowned or dried many, many seedlings to death. This time around, I have LOTS of little plants growing and they're getting more than two leaves! I have hope they may actually live long enough to be planted outside. I have a hard time keeping myself limited to a reasonable number of kinds of plants to grow. I really want to grow tomatoes, and I know it will be easier to do so if I buy tomato plants, but I couldn't resist starting some seeds. I found Green Zebra tomato seeds, Yellow Pear tomato seeds, and purple tomatillo seeds! I have no idea what to do with purple tomatillos, but I had to try to grow some. So far, I have plants of all three types growing. 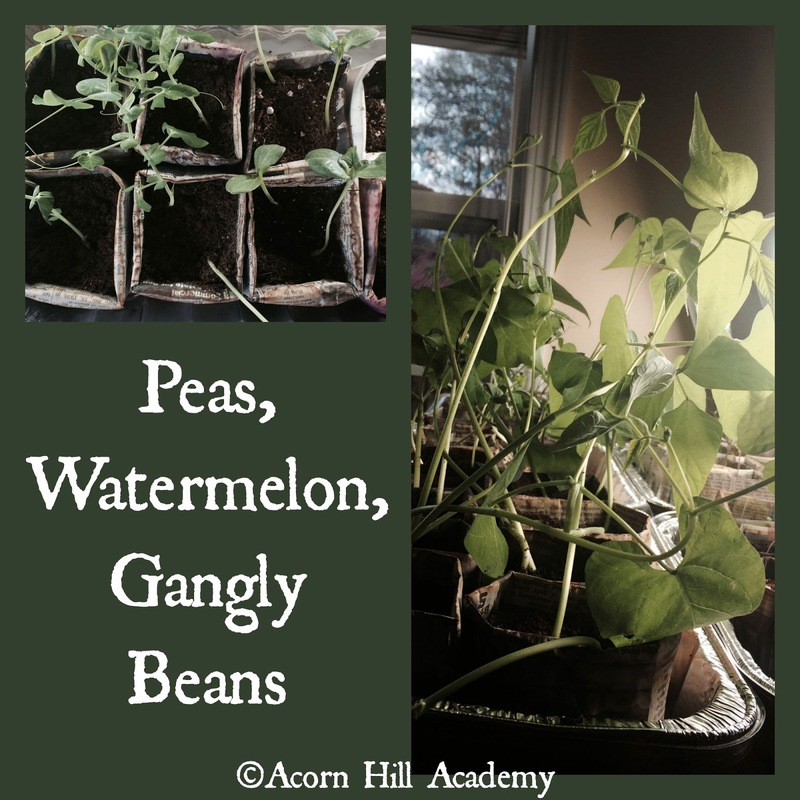 I also have some watermelon plants, some peas, and some very gangly green bean plants. Since I planted the beans, I've learned it's not necessary to start those inside because they sprout so quickly. I can affirm that. Heh. I have some dragon beans that I will plant outside when we get dirt for the beds, and cucumbers, and a few other things. This week, my parents visited to celebrate the girls' birthdays with us, and my dad built two little raised beds for me. They are 3' by 3'. 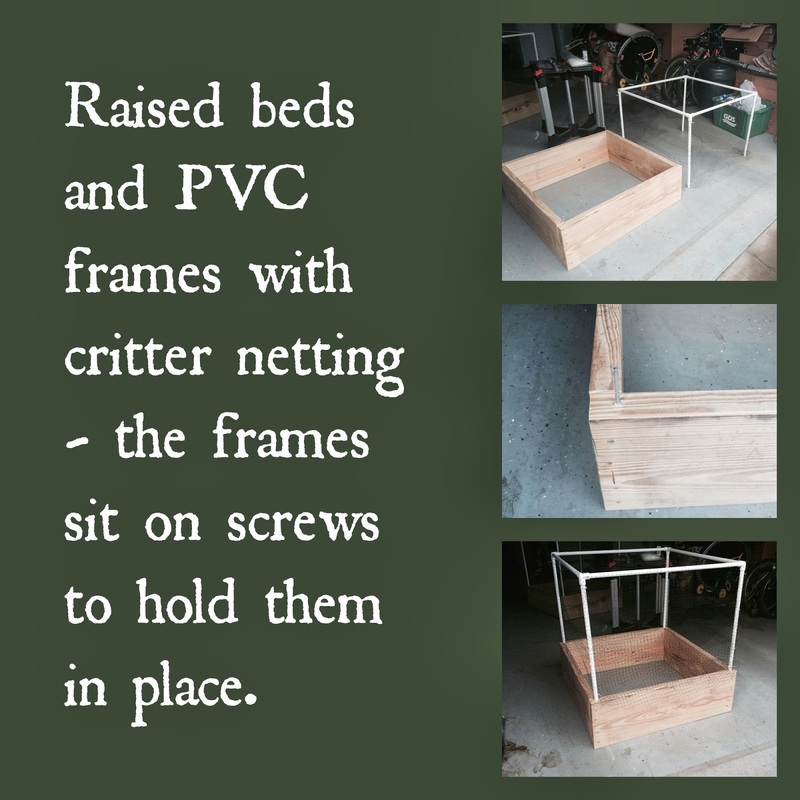 When we put them outside, we will put landscape fabric in the bottom, which will keep weeds from growing into the soil and also keep the dirt from eroding from underneath the frames. My dad also built little covers for them out of PVC pipe and "critter netting." Hopefully, those will keep any marauding animals from eating my plants or my produce. I'm really excited about my little gardens! I will share pictures when we get them set up with dirt and planted.